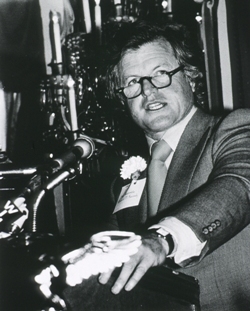 Senator Edward M. Kennedy at the 1978 Lasker Foundation Awards ceremony. Diagnosed in May 2008 with a malignant brain tumor, Sen. Edward M. Kennedy (D-MA) died August 25, 2009. Serving for 47 years—the third-longest tenure in Senate history—he battled for the disabled, the poor, the unisured and medically and emotionally disadvantaged. Among the many landmark laws enacted under his leadership and sponsorship are the Protection and Advocacy for Mentally Ill Individuals Act of 1986, the Nutrition Labeling and Education Act of 1990, the Americans with Disabilities Act of 1990, the Ryan White Comprehensive AIDS Resources Emergency Act of 1990, the National Institutes of Health Revitalization Act of 1993, the Freedom of Access to Clinic Entrances Act of 1994, the Health Insurance Portability and Accountability Act of 1996, the Food and Drug Administration Modernization Act of 1997, creation of the State Children’s Health Insurance Program (SCHIP) under the Balanced Budget Act of 1997, the Children’s Health Act of 2000, the Project BioShield Act of 2003, the Pandemic and All-Hazards Preparedness Act of 2005, the FDA Amendments Act of 2007 and the Genetic Information Nondiscrimination Act of 2008. August 1, 2009 in People.